I had one deeply important question: who is on Twitch right now with nobody watching them? I find the performativeness of Twitch pretty hilarious and wanted to see what people are doing sans audience. So I built Streaming Into the Void. I’ve since seen some great stuff like 24/7 Screaming Cowboy and a woman metal detecting alone in a forest. The process of making this was about as strange and painful as the streams it scrapes, so here’s the story of how I did it. By default stream results are sorted by greatest viewers. There is no option to sort in reverse. You are rate limited to 120 calls per minute and each call can retrieve maximum 100 streams. You can page across the vast number of streams through special page cursors you get back in the response. I would need to save the pagination cursor value I received in the response and send it in the subsequent request, letting me get the next page of results with the next batch. In my fetch function, if there are 0 results returned, I reset the cursor to start at the top. I discovered that in order to specify multiple games to filter by, I had to repeat the &game_id parameter many times. I’m using the request-promise-native package to async/await a response. If I get rate limited, I just break the loop. The defaults reflect a very tricky deployment to my Heroku-like host, Now.sh. CouchDB relies on writing to local files and my host is read-only after deployment. I found that I was able to build the database in a writable /tmp/ directory and since have it working with a Docker deployment. It’s possible to connect to a PouchDB on the front-end (in my case, in a React component named StreamList) just like you do on the server. I wanted to be able to randomly pluck out 2 streams that I’ve fetched in the last few minutes, which have the highest likelihood of still being live. Each time the query runs, I save the IDs of all the streams the user has seen to the component’s state. 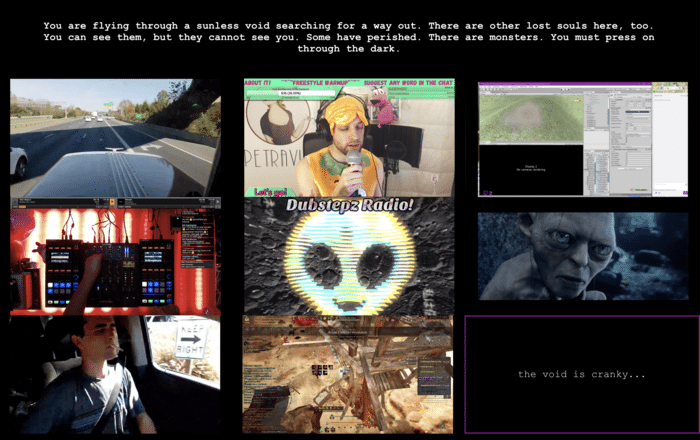 Thanks for following along - hope you enjoyed learning a little bit about scraping Twitch.tv with Node.js!